Figure 1: Sorting initial setting for each application field. This property is useful to define the fields that will allow sorting options. The field sorting is already applied inside the generated application, just by clicking on the name of the column (field) that the user wants to sort. By default the Group By settings will be considered for the fields sorting. Also by default, the first six fields are already checked (showing a star on the field left side), they can be sorted so that the user does not have to worry about that detail. Note: Use the on/off function to include or remove a field. Sets the initial sorting for each application field, it can be "ascending" or "descending" sort.. 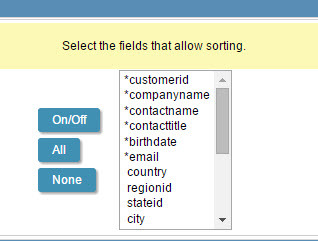 Defines the fields that are available by clicking in the "Sorting" button inside the Grid. Use displayed fields - Sets all the fields that are displayed in the Grid and that are available by clicking the Ordering button. Use columns - Sets all fields configured in the columns option as available by clicking in the Grid sorting button.